STOCKHOLM / ROME, Feb 25 2019 (IPS) - On January 25, 2017, the Trump administration signed Executive Order 13767, instructing the Government to begin new constructions and replacements of walls between the US and Mexico. From December 22, 2018 to January 25, 2019, the federal government was partially shut down due to President Trump’s declared intention to veto any spending bill that did not include $5 billion in funding for a border wall. It was with good reason the Congress withheld such an enormous sum of money. As the European experience indicates, building walls between countries has proven to be both obsolete and disastrous. 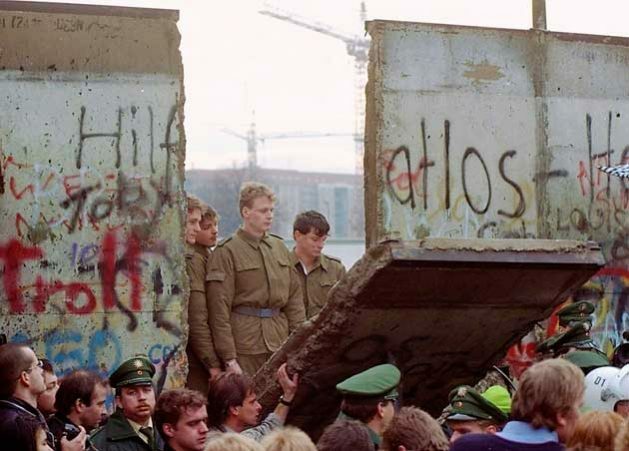 On the 3rd of March, 30 years have has passed since a wall splitting Europe in two parts began to crumble. This happened after a US president had pleaded with his Soviet counterpart: “Mr. Gorbachev, tear down this wall.” After receiving an informal clearance from Mikhail Gorbachev, the seventh and last leader of the Soviet Union, the Hungarian Government did on the 3rd of March 1989 initiate the lifting of the Iron Curtain by ordering the demolition of border barriers. This was the beginning of the disappearance of a dark shadow that for almost four decades had haunted the minds of all Europeans. I grew up within a divided Europe and after several times having visited the Soviet satellites I was well acquainted with the control and repression that reigned there before the opening of their borders. Nevertheless, back then I could not have imagined another world order. In those days the so called Iron Curtain was not only a physical boundary dividing Europe into two separate areas, it was also a mental division between us and them. An open wound stretching straight across the continent. A visible proof that World War II had not really ended, that the suffering it caused was far from healed and forgotten. Physically, the Iron Curtain took the form of border defences cutting through Europe. After World War II the Soviet Union had annexed Estonia, Latvia and Lithuania, turning them into parts of The Union of Soviet Socialist Republics. Eastern parts of Poland and Finland, as well as northern Romania had been incorporated into Soviet republics. Furthermore, between 1945 and 1949, The People´s Republic of Bulgaria, the People´s Republic of Poland, the Hungarian People´s Republic, the Czechoslovak Socialist Republic, and the People´s Republic of Romania had all been turned into Soviet satellite states. It was after 1950, when over 15 million people had emigrated from Soviet-occupied countries, that boundaries between East and West became fortified and almost impenetrable. For example, the border zone in Hungary started 15 kilometres from the actual frontier. A double, barbed-wire fence was installed 50 metres from the border line and the space between the fences were laden with land mines. Similar structures were erected along the borders of East Germany, Czechoslovakia, Norway, Finland and Greece. The change came sudden and the relief felt all over Europe was exhilarating. In April 1989, after the Hungarian Government had opened up the nation´s western borders, the Polish Government legalised the Solidarity movement, which in June captured 99 per cent of available parliamentary seats, culminating in the fall of Communism. On 9 November tens of thousands of East Berliners flooded the checkpoints into West Berlin and began tearing down the wall. The same day as the Berlin wall was broken through, the Communist leader Todor Zhikov was ousted from power in Bulgaria. On the 25th of November Ladislav Adamee, the Czechoslovak prime minister, resigned. The only former Soviet satellite state in which the demolishment of the Iron Curtain resulted in violence was Romania, where approximately 1 000 protesters were killed in the country´s third biggest town, Timoşoara. However, on 22 December 1989, the Romanian military sided with the protesters and turned against Communist ruler Nicolae Ceauşescu, who was executed after a brief trial three days later. Several of the authors´ fears have actually come true. The Russian dissident Andrei Sinyavskij wrote that when a multi-national empire like the Soviet Union disintegrates and its satellite states suddenly become “liberated”, it will result in xenophobia and ethnic conflicts. The old Communist myth of “bourgeois encirclement” might be supplanted by nationalism and fears of infiltration from unwanted immigrants. Others, like the East German Jurek Becker, wrote that the fall of Communism and an increasing distrust of Socialism, Religion and State Power might result in a lack of guiding principles, something to believe in, and people might lose themselves in consumerism and alienation. Josef Škvorecký declared that as a Czech he could not avoid doubting the outcome of the radical changes – when he was fourteen years old he had experienced how the Nazis occupied his country, ten years later Czechoslovakia´s Communist party staged a coup and assumed undisputed control over the Government, marking the onset of four decades of Soviet backed communist rule. Twenty years later Czech hopes for a change were thwarted by a Soviet invasion, and twenty years after that Škvorecký feared that ethnic tensions between Czechs and Slovaks would rip the nation apart. We must also withdraw from our untenable position in the war of debt against the Third World, and the most difficult retreat of all will be in the war against the biosphere, which we have been waging since the industrial revolution. The Russian-British historian of ideas, Isaiah Berlin, wrote that it was quite possible that the European euphoria might prove to be illusionary. Change must reach the depths of the human mind. The people of Eastern Europe did not rebel in the name of a great cause. They rebelled against the regimentation and dreariness of life. They wanted the consumer goods, the entertainment and freedom from arbitrary authorities offered by the West. They were raging at a system that had cheated them all their lives. According to Isaiah Berlin a sudden, overwhelming change like the fall of Communism had to be analysed, felt and understood by as many people as possible, not only by intellectuals and a privileged elite. What happened in Europe 1989 could not be allowed to become a “Revolution of the Intellectuals”, like the upsurge of liberal and democratic feelings that in 1848 toppled governments in Paris, Rome, Venice, Berlin, Dresden, Vienna and Budapest, only to be crushed by armies of conservative forces, which thus maintained the status quo. Berlin´s observation reminded me of the mainly unsuccessful Arab Spring, which in many places resulted in thwarted hopes and bloodshed. All contributors to the Granta magazine wished that the euphoria created by the fall of European walls would not be a temporary phase, but encourage a free market, freedom of speech, compassion and human interaction. The Iron Curtain had hindered people from leaving their country, while it was promoted as a protection from Western capitalism. The raison d´étre of the Mexico-US barrier is the opposite – to keep people out. Several of the prognostications presented in Granta proved to be accurate. Sinyavskij predicted that when a political ideology ceases to be considered as a threat, we will embrace other fears, like dangerous immigrants threatening our lives and culture. Enzenberger assumed that Russia would expand again, something that has been demonstrated by its annexation of Crimea and claims to other territories. It would have been fortunate if the Europeans after the demise of the Iron Curtain instead of embracing xenophobia and nationalism, had been able to remove mental and tangible barriers while embarking on a joint effort to foment sustainable development, reverse climate change, stop the predatory use of natural resources and other threats to humanity´s survival. We continue to hope for a better future, then and now. 1 New Europé! Granta No. 30, 1990. Jan Lundius holds a PhD. on History of Religion from Lund University and has served as a development expert, researcher and advisor at SIDA, UNESCO, FAO and other international organisations.